Fuji 2894-T75G Q4 review. Is it good? The Fuji 2894 T75G Q4 Quiet Spray system is an entirely innovative yet uniquely designed spray gun that has an added specialty of having a silent turbine resulting in less noise as compared to other models by FujiSpray. 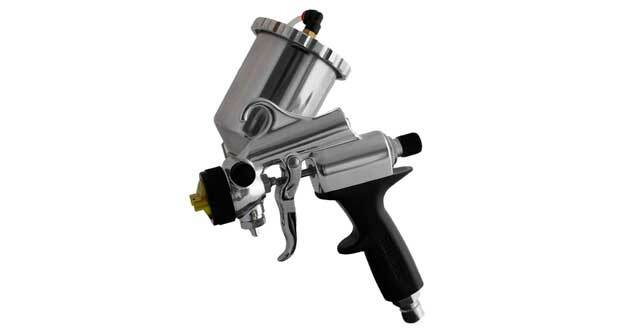 The spray gun is a non-bleed lightweight build model that has been designed ergonomically with a stay-cool handle for convenience. It also prevents heating up of the device. A quiet turbine as a part of FujiSpray’s patented noise reduction feature. Thus the gun is the best bet with the given price range, and hence it provides with the most in the given amount of money. As it works on high volume low pressure, the gun gives you one of the best efficiency and delivery rates possible. Also, the gun has been made with quite a convenient handle to ease the operation. The gun has a patented silenced turbine tech which works well in reducing the noise that was usually present in the models MM3 and MM4. Also, the gun is quite durable as reported by most of the users. Even though it is laced with pretty amazing features and there is no provision for a performance glitch, there is a drawback present. The user cannot use thick paints with this particular model.